To make crostini rounds; slice the baguette crosswise into 1/2 inch rounds, on a diagonal for a nice presentation if desired, place in a single layer on a cookie sheet, spray the slices lightly with olive oil, turn over and spray again. Alternatively, if you do not have an oil spray bottle brush one side of the slices lightly with olive oil. Sprinkle lightly with course salt, and bake for 10-15 minutes or until golden brown and toasted. Let cool on cookie sheet. Warm the honey in a microwave or in a small sauce pan on the stove just until loose and runny. To roast the pears; slice each pear in half, remove the core and slice each half into 1/4 inch slices. Arrange slices in a single layer on a lightly greased cooking sheet, sprinkle the pear slices with 1 tablespoon of the thyme leaves and drizzle with 1 to 1 1/2 tablespoons of honey. Bake the pears for 15 minutes or until the pears are tender and begin to brown. Remove from oven and let cool slightly. 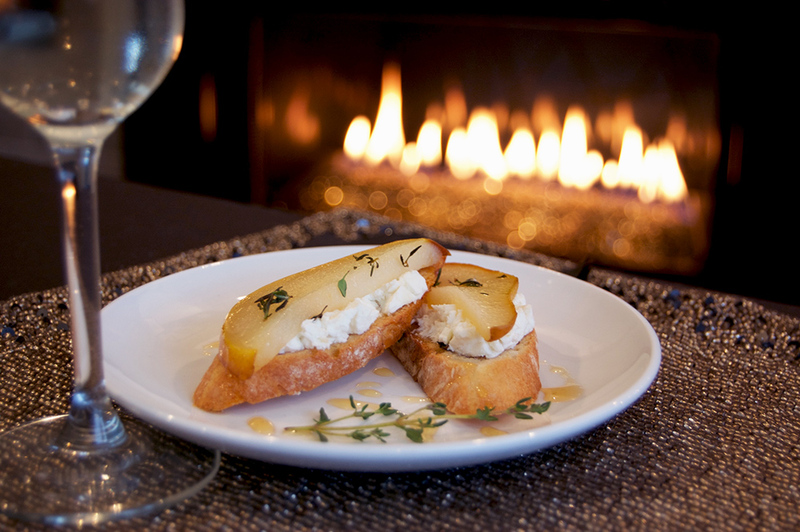 To assemble the crostini; spread each toasted baguette slice with about a tablespoon of goat cheese, top with a slice of roasted pear, arrange on a platter and garnish with the remaining thyme leaves, a few sprigs and a final drizzle of the honey. Serve immediately.